This pair of Kurt Geiger Snakeskin Salem boots (see previous Geiger Counter post for more details) are fantastically appropriate footwear for unpredictable Spring weather (if I’m allowed to call it Spring yet?!). The perfect foil to any unexpected shower, these fakey snakey bikers look funky and fresh with any outfit – and give my smart pink 3/4 length Karen Millen coat a suitably subversive and casual twist. I live on the South coast where it’s invariably brisk and brrreeezy, so along with the rest of Brighton I’m still wearing my winter woollies (which maybe answers my Spring question above!). Today’s long, silver-grey glitterball-style sequinned jumper is by Fenn Wright Manson. Its delicate colour and scalloped edges remind me of oysters – and lovely lady parts, which is perhaps why subconsciously I find it so appealing! It’s lovely and long and wonderfully warm, and it belts up beautifully. Plus, when the light shines on the sequins I become my own little glitter ball – which the kids just love! I’m not one for muted colours, but this textured top magically lifts my spirits every time I put it on. 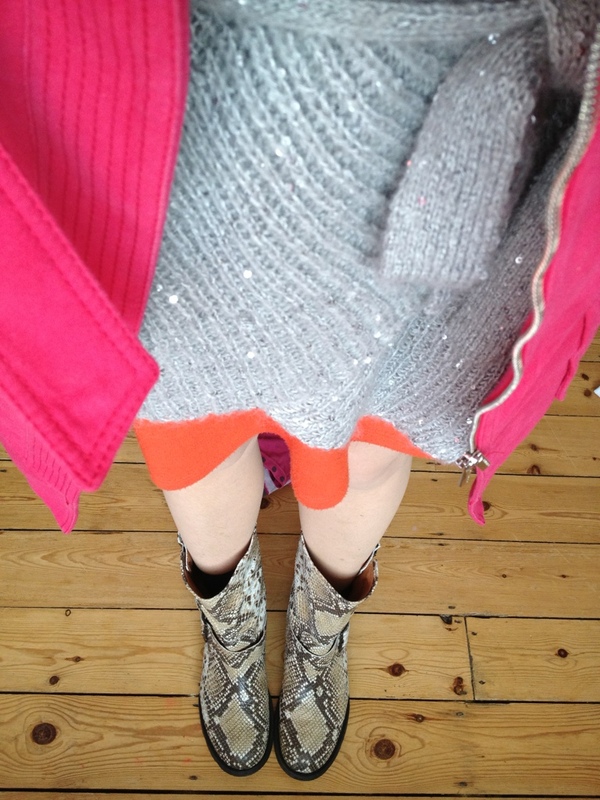 Unable to avoid my favoured colour-clash fashion entirely, however, I’m wearing these KG snakeskin boots, FWM silver-sequinned jumper and KM pink coat combination with an flippy orange dress from Dorothy Perkins. Thus attired, I am ready and prepared for any meteorological eventuality, and fashion-forward whatever the weather!